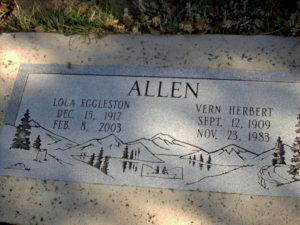 Lola Eggleston Gorder Allen – her story in her own words. 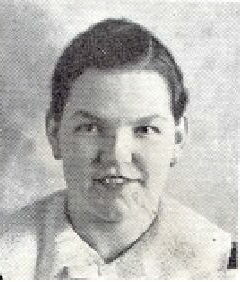 I was born December 15, 1917 to Joseph Smith and Talitha Cuma Cheney Eggleston, in Grovant, Wyoming. My family was Alice, Wesley, Me, Orland, Laura, Melvin, Dale, and DeLoss. Mama died when she was 49. She had an operation to remove some scar tissue. On Sunday she was sitting up in bed crocheting and on Tuesday we got the word she had died. Papa married Stella, who was Mama’s niece. Papa died at the age of 83. When I was two years old we moved to Utah by train. I was running in the isles of the train and a man thought I was such a pretty little girl he gave me a silver dollar. Mom bought me a pair of shoes with it. When it was time to go to school I didn’t start because I wan’t 6 in time so I had to wait a year. My first grade teacher was a fat woman. I didn’t like her. She taught for the first three years. On the fourth of July I had a chance to fish in the fishpond. She was the one to give the prizes. She had a black heavy straw hat she said was for the first pretty little girl that came by. I hated it. I never wore it. It was an old woman’s hat with thick rims and was flat on the top. I wanted a purse like the other kids were getting. It was so ugly. She brought her daughter to school the day it started. She put her in the second grade and said, “keep her there.” She later skipped a year so she was two years ahead of me and younger than me. I like to do the ironing when I was little and I had to do the dishes a lot. The iron was a coal stove iron. You had to have a real hot fire to heat the iron. You’d have to use two of them so you could trade off. This was before we had electricity. School was 2 1/2 miles from where we lived. We had to walk to catch a bus to go to high school. In the winter it was so cold and the snow so deep. When I was about 16 and going in the 10th grade, I moved to Ogden to work for my room and board and go to school. The first place I lived was with friends, Ray and Olive Rudd. I went to the Junior Prom with a boy that played in an orchestra they made up themselves. I went to the girls dance and we had to ask the boy. I went with the boy that took me to the Cadet hop at his school. I went to all the school dances with guys that were older. I loved to dance. When I graduated, Wesley gave me my class ring and Alice gave me a yearbook. I was staying in Ogden with George and Kathrin Stouckland and Phil chased with Kathrin’s brother. That’s how I met Phil. I used to tend Selma’s baby and didn’t know she was Phil’s sister. Phil and I got married in Norman and Nettie’s house. We didn’t have a honeymoon. We first lived at the old Nelson house. Winters were cold; the tea bottle would freeze and the linoleum would curl. I used to put the ashes in a board box and just put the box on a platform by the stove. We came home from the store one day and the hot ashes in the box had burned through the floor but the house didn’t catch fire. I never did figure out why it didn’t. We lived there for two years while Phil built us a new home. We stayed with the folks for a while. I had a miscarriage first, then I had Gail. I raised chickens and sold the eggs for extra money. The night Gail was born: I woke up – didn’t have any pain but was uncomfortable. Phil called his mother. We sat there talking and finally decided to go to the hospital. My water broke going down the stairs. I sat on the toilet while Phil went for the car. I still wasn’t having pains. Mother said I’d better get started. So we left. The pain started on the way really pressing going down the canyon. We made it to the hospital in a little over ten minutes. I told Phil to go get a cart. He came back and said the wanted me to walk in and I said I couldn’t move. So he went and got one. When I got to the delivery room and they were trying to undress me and I’d have a pain and couldn’t move. He was born 2:10 AM. That was before the canyon was changed. It had a horseshoe bend that was a really sharp turn. I never had long or hard labor with any of my kids. My kids all turned out pretty good. I’m proud of all of them. Once we decided to fatten and eat an orphaned lamb. We bottle-fed it, and soon it became a pet. When it came time to butcher it, nobody would to it. So we ate beef. In about 1998, Gail was in the hospital for high blood pressure. Ivan Rick was visiting and told of when he and some friends stole some of my chickens. He said there were so tough he couldn’t bite into the meat. We had some good friends, Dave and Bell Clawson. We did everything together. One day when we were riding around, we went to the Stoddard slough and saw this old boat and decided to take a ride. We went up the stream and back and then Dave and I got out of the boat. When Phil and Bell were getting out, the boat tipped over. They went down in all the weeds and dirty slough. Bell had just gotten her a hair permanent and she came out of all the mud and said “there’s $10 gone to hell!” Phil had on a pair of white wool pants that shrunk to where he couldn’t wear them anymore. We all laughed. We still do when we think of it. When Phil joined the church our troubles started. He didn’t like me to do what I liked to do and seemed to get upset if I got any attention. He started drinking and staying away from home. One time he was gone for over a week. I didn’t know where he was and couldn’t take care of the cows so I sold them. He never did come home so I filed for divorce. He didn’t talk to me after that. I married Vern Allen on May 24, 1969. We went to Las Vegas and lived there for 16 years. He got sick with cancer so we moved back to Ogden to live until he died on November 23, 1983. I did Temple work doing sealings, then I did extraction work. I enjoyed it. That lasted for several years. I don’t know much about Mom’s growing up years. She never said a lot that I remember, past the usual “why, when I was little, we had to walk two miles to catch the bus, the snow so deep we walked over the fence tops” when any any of us kids complained about having to stand in the cold while waiting for the school bus. I suspect that in her case, it was probably very near the truth. I don’t believe Mom’s growing up years, for the most part, held many pleasant memories for her. In my untrained view, Mom was punished a lot by her father and she was very afraid of him. Her Dad, Grandpa Eggleston, was held in check to some degree by Mom’s mother before she died. Mom felt singled out by her Dad. 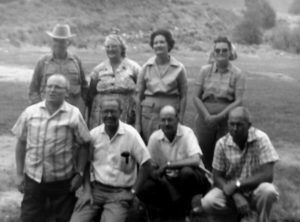 She tells of one time he “beat me with a singletree.” For all that, she loved him and took some pride in how well he maintained his farm and how well he cared for his cows and other animals. Mom always seemed to me to be unhappy. By the time I was old enough to notice, Mom and Dad were having trouble, so maybe that was part of the reason. Mom and Dad divorced, then Mom married Vern Allen. Vern was also from Morgan, an old neighbor in fact. He was a reformed alcoholic himself, but Mom seemed to like him and was happy during her time with him. 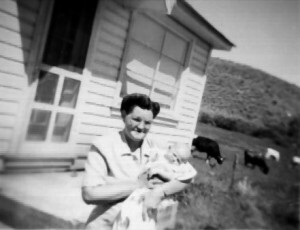 While Dad and us boys were out doing farm and animal stuff, Mom worked at maintaining a neat and comfortable home for us. She baked bread and I remember on occasion she made her own lye soap. In addition to maintaining the house, Mom was mostly in charge of caring for two chicken coops full of laying hens. 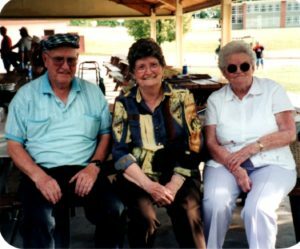 Lola’s Obituary mentioned that she “enjoyed quilting and hand needle work, creating countless beautiful works of art over her lifetime. All are treasures to those fortunate enough to own one. I am one who was fortunate to own one – a tablecloth she gave me for a wedding gift. 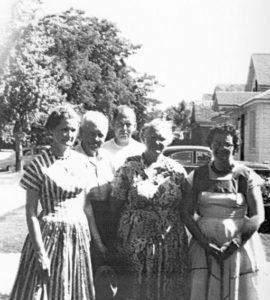 In 2001 we had an Eggleston Family Reunion. We had not had one for many, many years. This was the last time Lola was with many family members. I remember that Lola fell and broke her hip some months before she died. I visited her in the Care Center. 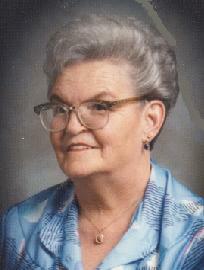 She passed away on February 8, 2003. She was buried in the Milton Cemetery. 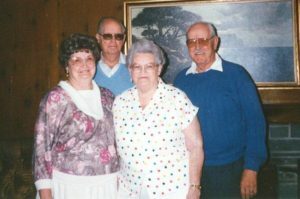 Note: Lola wrote her story, which her son Dee and wife Karen included in a Gorder Family History book. 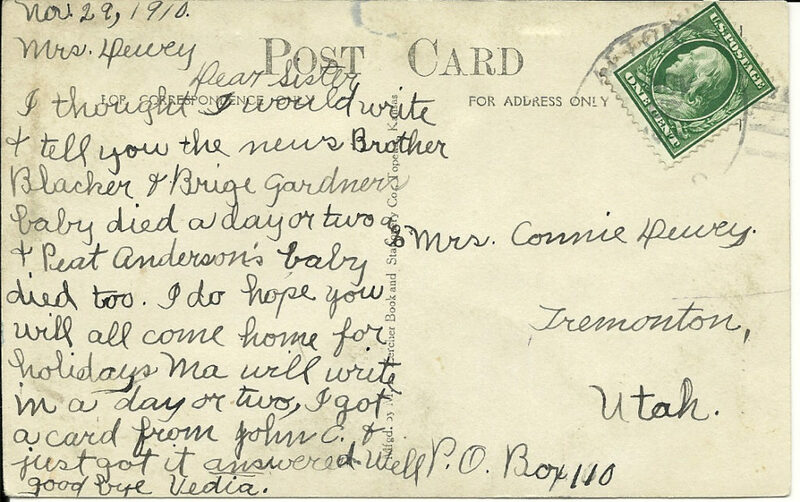 Postcards were an easy and inexpensive way to keep in touch with family and friends in a time when there were few telephones and no internet. In the early 20th Century they were like Social Media, sharing bits of news and often short messages in between longer letters. They were written on postcards showing familiar scenes or with simple greetings. Vedia Eggleston’s Postcard Book contained postcards from nearby places where friends and family lived. 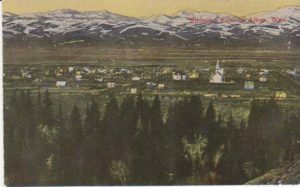 Other postcards from places further away are shared in another post. 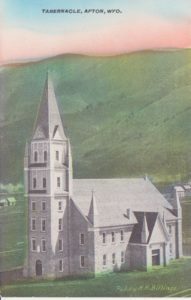 This is the Tabernacle of the Church of Jesus Christ of Latter-day Saints in Afton, Wyoming, Vedia’s home town.